Find out what you need to know about investing in the tobacco industry. The tobacco industry has been one of the most lucrative long-term investments in the stock market, but it has also drawn huge amounts of controversy. While many investors feel perfectly comfortable profiting from sales of cigarettes and other tobacco products, others who follow socially responsible investing principles avoid investing in tobacco entirely on the grounds that the products aren't beneficial to their users' health. Yet despite having faced decades of litigation and regulatory struggles, the tobacco industry continues to plow ahead and produce impressive profits for its shareholders. Let's take a closer look at the tobacco industry and how it has made so many investors rich over the years. What defines the tobacco industry? Tobacco companies are best known for the cigarette brands they produce. Most companies in the industry also make other products, such as chewing tobacco, and some companies specialize in cigars. But cigarettes dwarf sales of other products, even though the long-term trend in cigarette sales over the years has been toward lower volumes. Most U.S. investors focus on the domestic cigarette market, which is admittedly one of the largest in the world. But the Chinese smoke the most cigarettes of any nation, and even on a per-capita basis, Russia and other nations in the Eastern European region have higher smoking rates than the U.S. At the same time, prices vary widely for cigarettes across the world, ranging from the equivalent of $16 per pack in Australia to less than $1 per pack in Pakistan, according to a crowdsourced study commissioned by Numbeo. What is the history of the tobacco industry? Tobacco has a long history in the Western Hemisphere, dating back well before the time when the first European explorers visited the Americas. But Europeans first encountered tobacco when the explorers came to the New World, and the plant became extremely popular in Europe. This helped to spur the colonization of the New World as explorers and entrepreneurs saw the potential of using plentiful land resources to grow tobacco efficiently and form one of the key elements of trade between Europe and its colonies across the Americas. Source: Wikimedia Commons, courtesy Takeaway. Among the industry's major players, Philip Morris' origins date back to the mid-1800s, while Lorillard takes its name from founder Pierre Lorillard and the enterprise he started in 1760. Foreign companies Imperial Tobacco and British American Tobacco represent combinations and joint ventures among various formerly independent ventures, as waves of consolidation led to greater efficiency in the industry. More recently, though, the history of tobacco has become increasingly contentious. Product-liability lawsuits in the second half of the 20th century led to long legal battles that many predicted would cause the tobacco industry to collapse. Yet time after time, the industry has emerged relatively unscathed, and even as tobacco use has fallen somewhat as a result of educational and advocacy campaigns recommending that people quit smoking, tobacco companies have been able to remain profitable, as even rising prices from higher taxes haven't been enough to cut demand. That has led to some of the huge returns that major industry players have enjoyed both recently and over the long term. For instance, Altria Group is one of the oldest and most profitable stocks in the industry, with huge long-term returns over the decades. 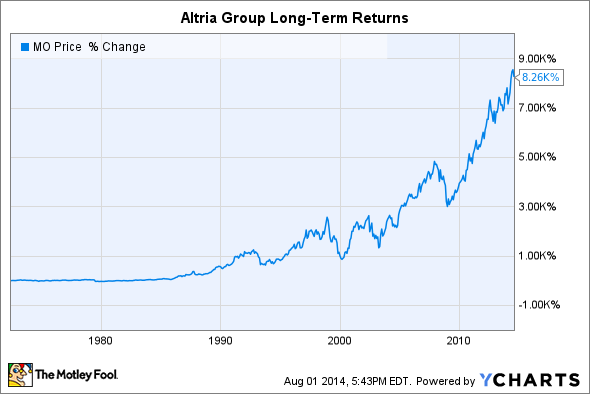 Altria Group data by YCharts. How many major companies are there in the tobacco industry? In the U.S., the major tobacco companies in the industry are Altria Group, Reynolds American, and Lorillard. But the international market is much larger, and that's a big part of why former Altria subsidiary Philip Morris International has the largest sales of any publicly traded tobacco company in the world, followed in order by British American, Japan Tobacco, and Imperial Tobacco. In the U.S., the three major companies listed above make up almost 85% of all market share in the domestic tobacco industry, leaving the rest to be split among smaller players including Vector Group. Altria dominates the list with 46% market share, but the proposed combination of Reynolds American and Lorillard -- expected to close in the first half of 2015 -- would create an entity with almost 39% market share, challenging Altria. Tobacco industry data by YCharts. Why invest in the tobacco industry? 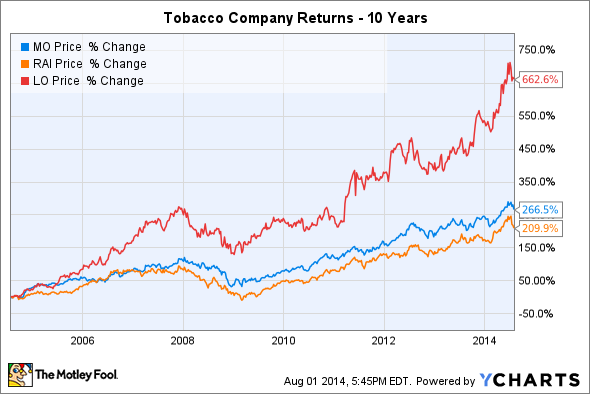 Investing in tobacco at first seems counterintuitive, especially given the long-term trend toward lower volumes. But even with high levels of taxes, tobacco remains inexpensive, giving companies reasonable margins that they use to finance share repurchases and generous dividend yields. The tobacco industry has a long history of being a lucrative target by income investors, and as interest in dividend stocks has increased in recent years, more investors have put aside any reluctance to invest in tobacco in favor of generating portfolio income. Moreover, even as cigarette use declines in the U.S. and other major markets, newer markets remain hotbeds of potential growth for tobacco. At the same time, electronic cigarette use has climbed considerably in recent years, as the smokeless nicotine vapor delivery system becomes an accepted alternative to cigarettes among users. For the moment, e-cigarettes aren't as heavily regulated as traditional tobacco products; while that's likely to change, the e-cigarette market attracts the attention of growth investors looking for a path to higher profits down the road for tobacco companies. Lorillard's blu eCigs brand of electronic cigarettes. Source: Lorillard. Nevertheless, the tobacco industry will remain controversial as long as it sells a product that's addictive and harmful to health. So far, the controversy hasn't endangered the industry's survival, but many see it as a longer-term threat to its continued growth. The decision whether to invest in the tobacco industry is a personal one, but what's indisputable is that the long-term returns of major tobacco companies have been among the best in the stock market.